Okay, so I have been really bad about getting this picture posted. 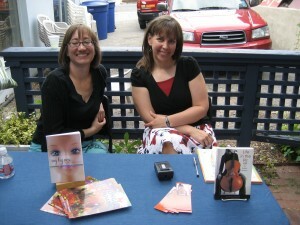 Here I am (on the right) at one of the author signing tables with my good writing buddy Sydney Salter. The two of us met years ago at the Brigham Young University Writing for Young Readers Workshop. It is a fabulous workshop–and it obviously can help. Here’s the two of us now, signing copies of our published books!